Seven out of 10 South Koreans think the economy is in bad shape while nearly half of people think they are in a bad economic situation, a new poll has revealed. 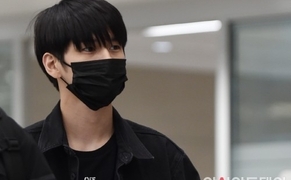 The poll, conducted by a survey agency R&Search on behalf of AsiaToday, asked 1,174 adults aged more than 19 about their views on the Korean economy in a phone survey from August 12-13. When asked about the current state of the Korean economy, 38.4 percent and 37.1 percent of respondents said the economy is in "very bad" and "bad" shape, respectively. Especially, 85 percent of business owners and 80.8 percent of full-time housewives felt that the economy was in a bad situation due to inflation. Many think that primary responsibility for economic problems lies on politicians. More than 46 percent of respondents said parliament and the political community that do not legislate in accordance to the economic environment are mainly responsible. 31.4 percent said main responsibility lies on the government's economic policies, and 13.5 percent said it lies on large conglomerates. 77.7 percent of respondents said the economy is in bad shape due to internal factors rather than external factors (4.3%). 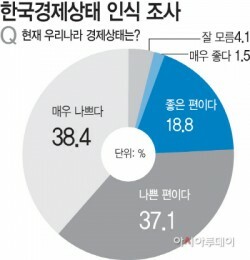 When asked who is in charge of the nation's economy, most of respondents answered President Moon Jae-in while 34.7 percent answered Kim Dong-yeon, deputy prime minister for economy and head of the finance ministry, followed by Cheong Wa Dae's chief policymaker Jang Ha-sung (21.0%). On the other hand, a whopping 19 percent said there is no economic control tower. Regarding Samsung's 180 trillion won investment plan for the next three years, 31.5 percent said fulfilling its promise is the most important thing. 15.8 percent of respondents said they think it is positive as an economic powerhouse. Among retirees and people engaged in agriculture, forestry, and fishery, more than 3 out of 10 viewed it positively. Despite some criticisms that President Moon Jae-in face over his withdrawal of presidential election pledges, more than half of respondents (51.4%) said they agree with the president's deregulation move. There were mixed views on the government's residential power bill relief in response to the country's unprecedented summer heat. However, 20.4 percent put off their decision. Among respondents in their 30s, the majority (51.6%) were satisfied. On the other hand, nearly half of respondents in their 50s said they were unsatisfied. More than half of business owners (52.4%) and retirees (50.6%) were also unsatisfied. The survey was conducted via a wireless phone automated response system using structured questionnaires with a 6.3% response rate.